It is the highest rainfall of the season so far in 24 hours. 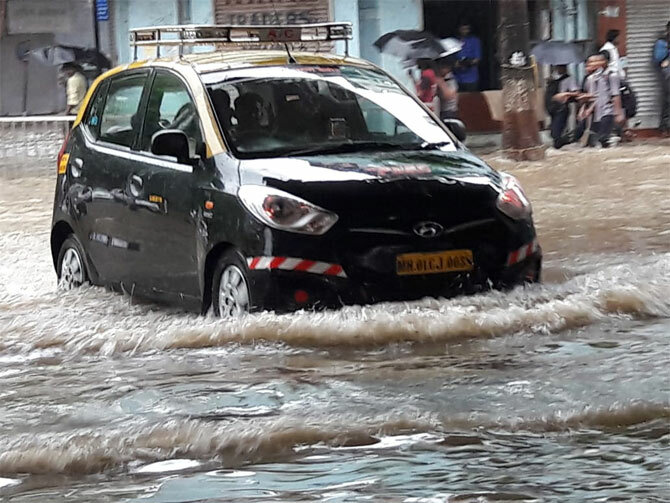 Heavy rains lashed Mumbai and its neighbouring areas on Monday, flooding streets and badly affecting life in the city where nearly 90 train services on the suburban network were cancelled. 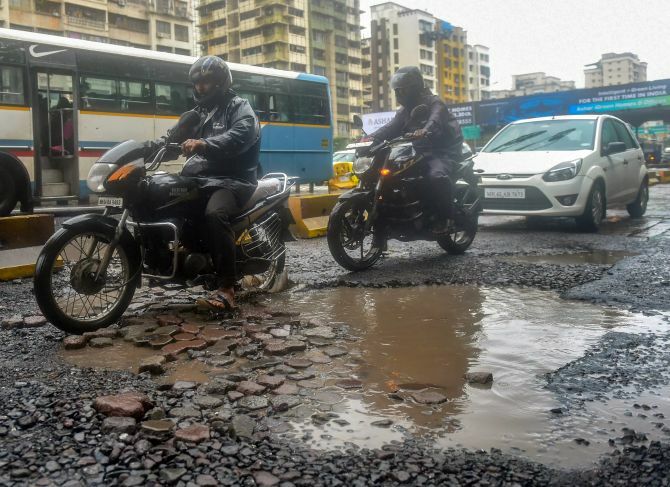 A 43-year-old woman riding a motorcycle as a pillion was crushed by a bus after the two-wheeler hit a water-logged pothole in Thane district of Maharashtra. 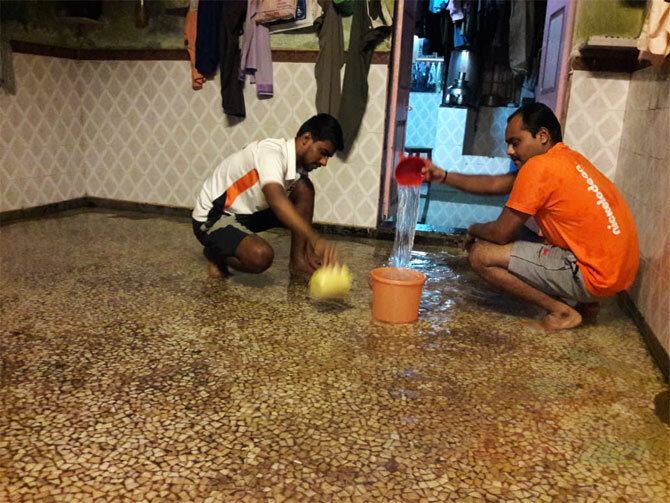 Around 300 people were stuck in their homes in Vasai town of the adjoining Palghar district due to waterlogging in the area. However, they refused to be evacuated even as the water level receded. The residents preferred to stay in their homes instead of relocating to some temporary shelter in response to the district administration's appeal for evacuation, a district information officer said. Some of them accepted food packets given by the administration, he said. "We have kept an ambulance near their homes as a precautionary measure," the officer said. 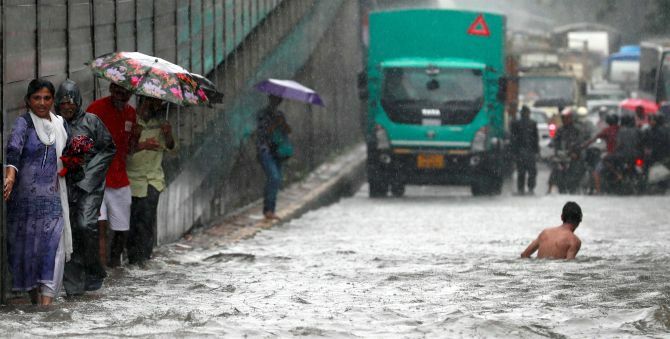 The rainfall of 170 mm (recorded in Colaba observatory for the Mumbai city) from 8.30 am on Sunday morning till 8.30 am on Monday was the highest in a 24-hour period during the current monsoon season, Metereological department's deputy director general K S Hosalikar said. From 8.30 am to 5.30 pm on Monday, the Colaba observatory recorded a rainfall of 104.8 mm. 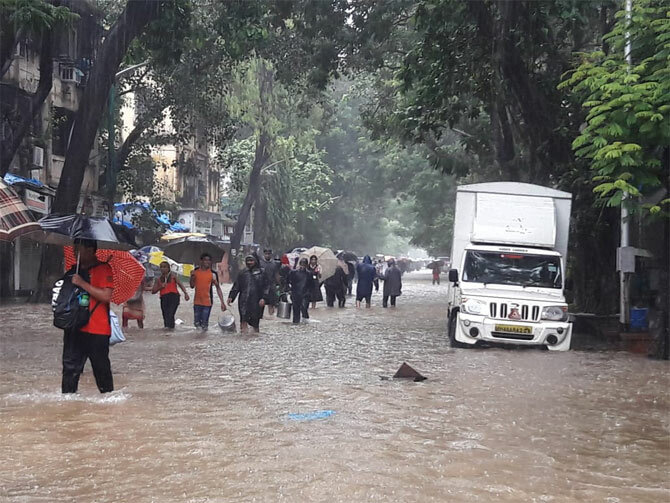 The Santacruz observatory, which records rainfall for suburban Mumbai, reported the downpour of 122 mm during the 24-hour period from 8.30 am on Sunday and 75 mm from 8.30 am to 5.30 pm on Monday. The rainfall slowed down the pace of the financial capital, which is heavily dependent on local train services. Though the intensity of showers receded as the day progressed, it took longer time for the city traffic to revert to its pace. 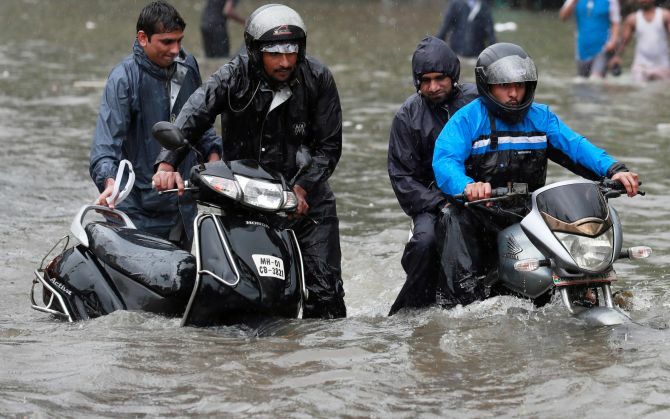 The rainfall caused traffic jams as many roads and streets in the metropolis were flooded and people were seen wading through knee-deep water. 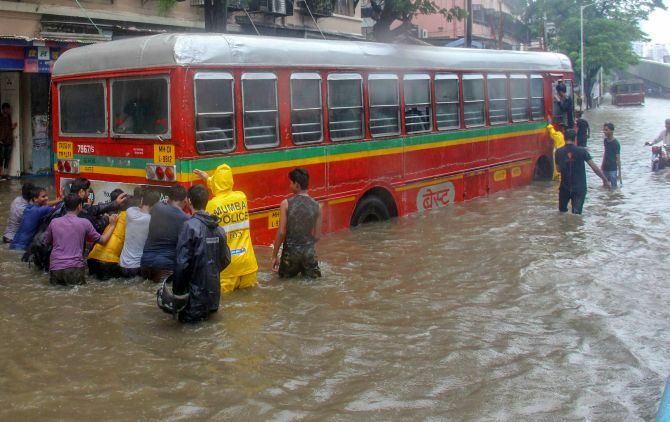 As many as 87 local services on the Central and Western Railway were cancelled due to the heavy rains, said officials. Vehicles on many roads were seen crawling because of the rainfall and low visibility. Schools and colleges in Mumbai were shut while the Mumbai University said examinations will be rescheduled for students who could not appear for it on Monday. 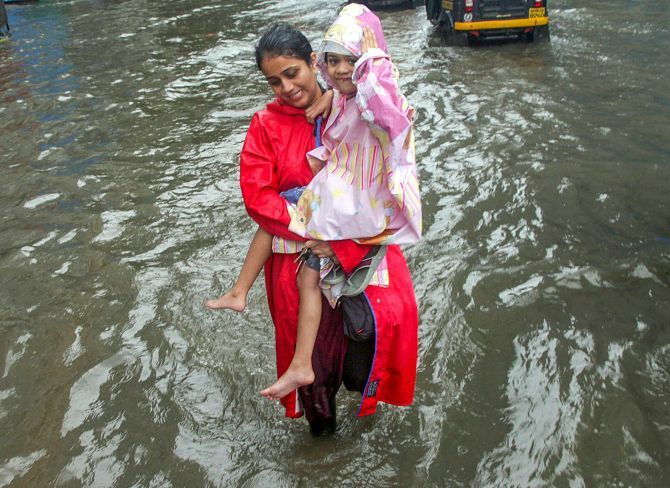 There was heavy water-logging in Mumbai's central areas of Kurla, Sion and Dadar. Mira Road (in adjoining Thane district), and Nallasopara and Vasai (in Palghar district) were largely affected due to the heavy showers. 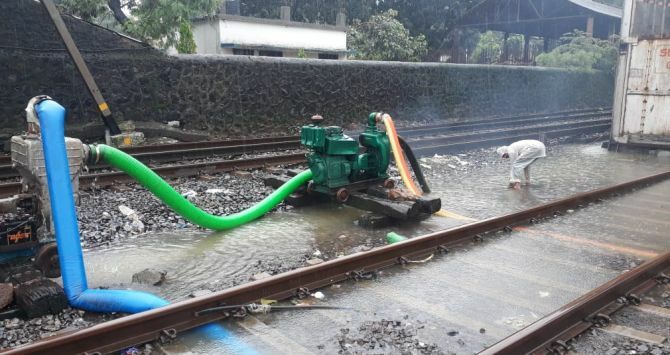 Train services of the Central Railway and Western Railway were slightly delayed due to water-logging on rail tracks in some places, officials said. 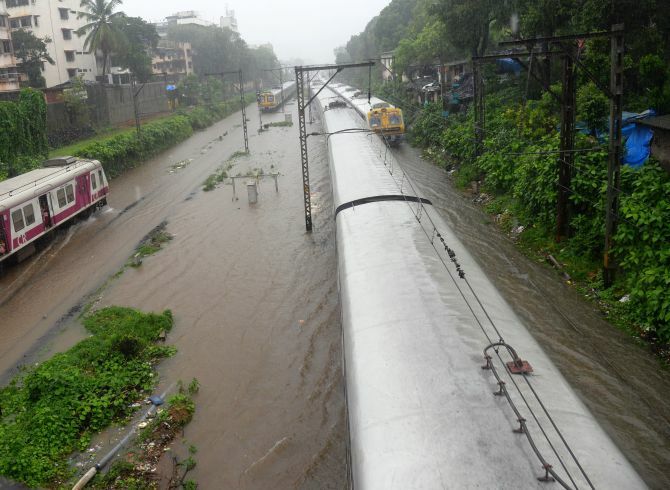 Some long-distance trains to Gujarat and northern states were halted at Borivali as tracks near Nallasopara and Virar were submerged. The trains left after a delay of about one hour, a spokesperson of the Western Railway said. Brihanmumbai Electric Supply and Transport buses were slightly delayed, but no service was cancelled or suspended, a BEST spokesperson said. The city's neighbouring areas got even more rains, and roads were submerged. Visibility at the Mumbai airport was "not very good" but flights were operating according to schedule, an MeT official said, adding no warning has been issued for the aviation sector so far. 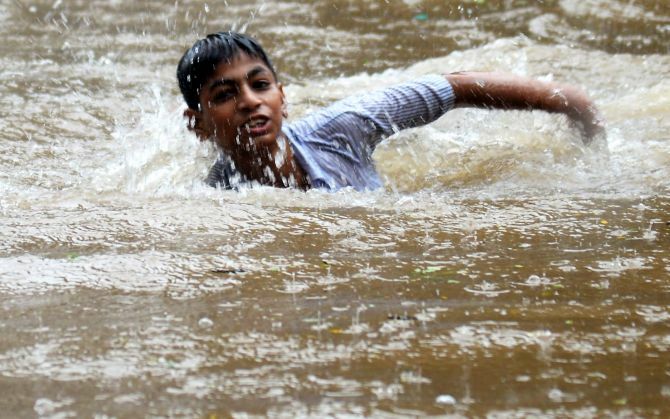 The meteorological department has forecast more heavy rains in Mumbai on Tuesday. 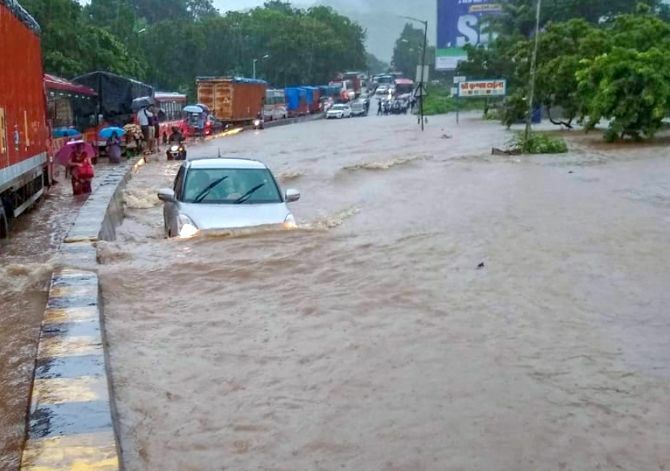 Hosalikar said the intensity of rains in the city's neighbouring districts of Palghar, Raigad and some parts in the south Konkan region was even more "vigorous" with these areas receiving 200 mm rainfall since Sunday.